Operation C is a run 'n' gun game that was released as Contra in Japan and Probotector in PAL regions. It reuses some stages from Konami's Super C (NES, 1988) but rather than being a straight port the levels have been tweaked to work better on the smaller screen. 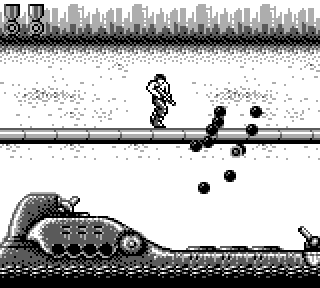 Stages 1, 3 and 5 take place in horizontally scrolling levels while Stages 2 and 4 mix things up a bit and introduce vertically scrolling levels, similar to the 1985 arcade game Commando. There's a decent amount of power-ups available including the Spread Gun, Fire Gun and Homing Gun. The latter weapon is a bit overpowering and once you have it you'll mow down enemies and most bosses with relative ease. The sprites are small but the expanded view makes it easier to plan for enemy attacks and allows you extra time to react to incoming fire. The amount of bullets on screen at any time is astonishing and you won't see any slowdown. Unfortunately there are only five stages and once you know what you're doing the entire game can be beaten in around 20 minutes. It's still tough (especially the final level) but it's generally a lot less hectic than its NES counterparts. The game is so much fun to play though and it controls beautifully - whenever you die you'll always feel like it was the result of a user error rather than a cheap hit. The graphics aren't anything special but there's some nice detail in the backgrounds such as the swaying palm trees in Stage 3. Some iconic music has been ported over from the original Contra (1987) including the awesome Stage 1 theme. The SFX are great with satisfying explosions and the sound of guns rattling as they spray out rapid-fire bullets across the screen. Operation C is a classic Game Boy title that's only really let down by its short length. It's incredibly well designed and Konami did an amazing job getting the series onto Nintendo's handheld without sacrificing too much in the gameplay department. Random trivia: Parts of the game were altered depending on the territory where it was released. For example, Japan had a stage select option on the title screen, the U.S. had a revised plot, and PAL regions saw the main character and enemies changed into robots!